Plus, Town Tavern and Marley G’s Pizzeria arrive on Alameda’s Park Street. Redfield Cider & Bottle Shop will offer about 150 bottled ciders. Cider lovers, you’re in for a treat this week. 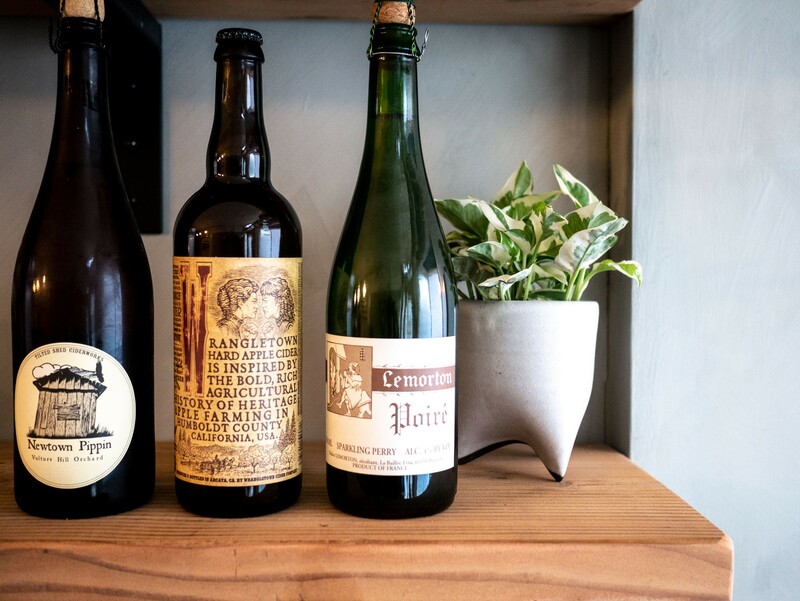 Redfield Cider & Bottle Shop is set to open in Rockridge on Sunday, Jan. 6, with 16 beers and ciders on tap and approximately 150 bottled ciders. As the Express reported in April, Redfield Cider was founded by Olivia Maki and Mike Reis, a husband-and-wife team. According to Redfield’s website, it’s named after the Redfield variety of apple, with a tart, astringent flavor that’s not great for eating or baking, but is ideal for making cider. The East Bay-based couple bring years of experience in the food and beverage industry to the new bar and bottle shop. Maki is a former employee of Bi-Rite Market in San Francisco, and Reis is an Advanced Cicerone who’s worked at The Monk’s Kettle and Lagunitas Brewing Company. In June, Maki and Reis even started their own cider-focused podcast, Redfield Radio. Along with ciders, Redfield will also offer a “simple but satisfying” menu of salads, sandwiches, and small plates that are made in conjunction with local farmers and food producers, and “influenced by the cuisine of great cider cultures,” according to a recent press release. Redfield Cider & Bottle Shop is located at 5815 College Ave. in Oakland. It’ll be open from noon to 11 p.m. Sunday through Thursday, and noon to midnight Friday and Saturday. … In other food news, Alameda’s Park Street has had a couple of newcomers in recent weeks. In mid-December, Town Tavern opened at 1437 Park St., which formerly housed a gift shop, Silver Tree. There’s a menu of signature craft cocktails, as well as ciders and beers on tap from East Bay breweries, including Drake’s, Faction, and Old Kan. Plus, there’s a tasty-looking menu of sharable plates including karaage style chicken bites, pierogies, chicharrones, poutine, New Orleans-style barbecue shrimp, and housemade ricotta with warm bread. Thankfully, you can now get your stromboli fix at Marley G’s in three varieties: the classic, filled with ham, salami, pepperoni, and mozzarella; the “whitey,” with goat cheese, olives, pesto, and spinach; and the “guatso,” stuffed with beef meatballs, sausage, pepperoni, and mozzarella. There’s also a menu of chicken, eggplant, meatball, and veal parmesans; rotisserie chicken; salads; pasta; and of course, pizza. There are currently 10 varieties of pizza to choose from, including the banana chicken curry pie: a curry sauce base topped with sliced bananas, mozzarella, red onion, chicken, and cilantro. Gluten-free cauliflower crust is also available. There’s also a short-but-sweet dessert menu (including cannoli! ), and beer and wine are coming soon. The pizzeria is open for lunch and dinner daily.